Working hard to assess individuals….now scheduling from August and beyond, 2017! 1. Non-Test Assessment (one of the options given in the Washington State law, but helpful for any parent). Read about this assessment. 2. Brain Training Assessment – some parents choose this assessment if a child has learning challenges. Using the neurodevelopmenal approach our learning specialist assesses the child and then designs an Individualized Neurodevelopmental Plan which the parent may do at home. Additionally, they may choose to add ongoing support with our Brain Trainer. If a parent is not sure, they can choose the non-test assessment and then within a month may do an upgrade at a discount. 3. NEW – online assessments available as of February 1, 2017 – Structure of Intellect Assessment. Following the Assessment a Training Module(paper) with CD is compiled for the student. This would be an excellent follow on to the Brain Training Assessment. to help you decide which option is best for you. Dr. J. P. Guilford – During WWII given the task of determining why 35% of Air Corp pilot training candidates who were healthy and had an IQ of 120 or more were washing out. Guilford used a set of job descriptions for pilots, navigators and bombardiers to construct a test. Then he compared the scores of successful trainees with unsuccessful trainees. He kept those test items that were consistent with the outcome and threw out the rest. This new test was a better predictor of success. The attrition rate dropped below 10%. Dr. Mary Meeker and Dr. Robert Meeker have taken this “work place” model and developed an educational SOI. Structure of Intellect Model –a different way to look at and measure intelligence. I. Three Hemispheric (Dimensions) Learning Styles – Right, Left and Mid- sides of the brain. Each ability takes one of each of the three main areas – using a letter from each – get a subtest and an ability – MFU. How does this differ from achievement tests? Achievement tests – lack of success without a cause. In medicine: Taking a temperature fever, but without a cause. 24 abilities that relate to basic learning. SOI uses Training Modules (paper & / or CD). Home educators must consider important questions regarding the issue of academic testing. Ask and answer these questions as you prepare to assess your child’s progress. Why should I have my child assessed or tested? One very practical reason is that your state law may specify that you must. Whether or not the state is overstepping its authority with such a law is a question for another time. Knowing the homeschool law in your state is only the first step in this consideration. For some their state law requires some sort of testing annually and some state require testing at only certain grade levels, every two or three years. Some state laws specify which tests, types of tests and who can administer the test. Besides the law, having your child assessed or tested can provide a third party evaluation of the progress your child is making. I do recognize that parents know their child much better than any other person, regardless of the training of either the parent or the test administrator. However, we may have a blind spot regarding some areas. Test results can provide direction and encouragement. To maximize the information you receive you should interview the test administrator to learn if that individual will provide the information that you need or want from the process. The test administrator may also be able to answer other questions regarding educating your child. Another reason to have your child assessed is to prepare a child for future testing for college or for obtaining a job. When done on an annual basis, a child is more likely to take in stride any of the normal “butterflies in the stomach” he may experience. What kind of test / assessment should we use? Again, refer to your state law to determine what types of tests or assessments will fulfil the law. You may decide that what you need is a different assessment tool so you may choose to do one to comply with the state and another to gather the information you require. There are two general types of test that would usually be used for an annual assessment. First, consider a standardized, normed test. Test makers standardize the way the test is administrated so that when they use an average sample group of test takers, they can compare your child’s scores with the scores with the “norming group.” These are often more objective than the second type. Second, there are non-test assessments. In the state of Washington, the non-test assessment is not defined, but the one administering it must be a certified teacher currently working in the field of education. Your state may define this second choice more specifically. In Washington, teachers who administer non-test assessments may use a variety of tools and / or may evaluate student work in the different subjects. Your interview will help you find an administrator and an assessment right for your child. Most children feel less stress with the non-test assessment and you may be isolating what your child knows from learning how well your child tests. On the other hand, some children feel like they are on the spot during a one on one assessment and prefer the anonymity of the standardized test. 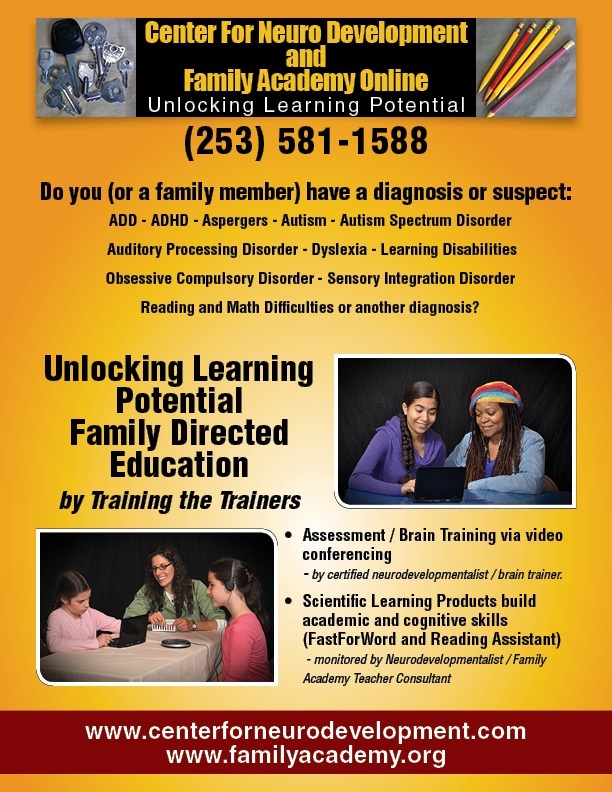 It is possible that your child will benefit from diagnostic testing – to find holes in learning or testing to determine if there is a learning difficulty. What tests do you administer? Will I need to stay on the premises during the testing? Or, may I sit in during the assessment? What are your qualifications for administering this test / assessment? How long have you been testing? Based on this information (what you provide) which test would you recommend for my child? If a group test, how many will be in the testing? For information regarding homeschooling testing and other matters, contact the Home School Legal Defense Association: www.hslda.org They provide information regarding the homeschool laws in all 50 states as well as state wide homeschool organizations. It is a great first website to learn about homeschooling. For Washington State residents, find test providers on www.washhomeschool.org (look under homeschooling, the law, annual testing, and list). One way to help prepare your child for standardized testing is to use workbooks that are designed to provide practice. When using these, set aside a time when you can provide a testing-like atmosphere to give your child a good idea of what to expect. There are two general types of test that would usually be used for an annual assessment. First, consider a standardized, normed test. Test makers standardize the way the test is administrated so that when they use an average sample group of test takers, they can compare your child’s scores with the scores with the “norming group.” These are often more objective than the second type. Second, there are non-test assessments. In the state of Washington, the non-test assessment is not defined, but the one administering it must be a certified teacher currently working in the field of education. Your state may define this second choice more specifically. In Washington, teachers who administer non-test assessments may use a variety of tools and / or may evaluate student work in the different subjects. Your interview will help you find an administrator and an assessment right for your child. Most children feel less stress with the non-test assessment and you may be isolating what your child knows from learning how well your child tests.